Not only that, slow cooker tostadas. 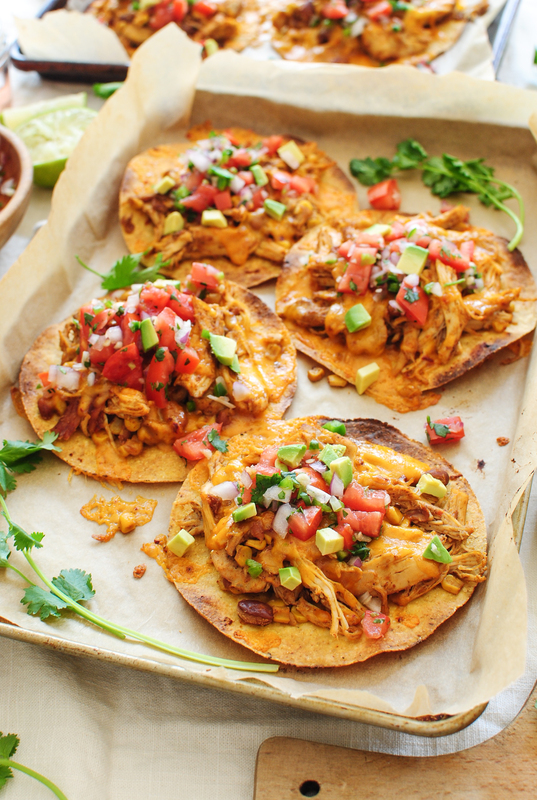 Slow cooker chicken and bean tostadas. 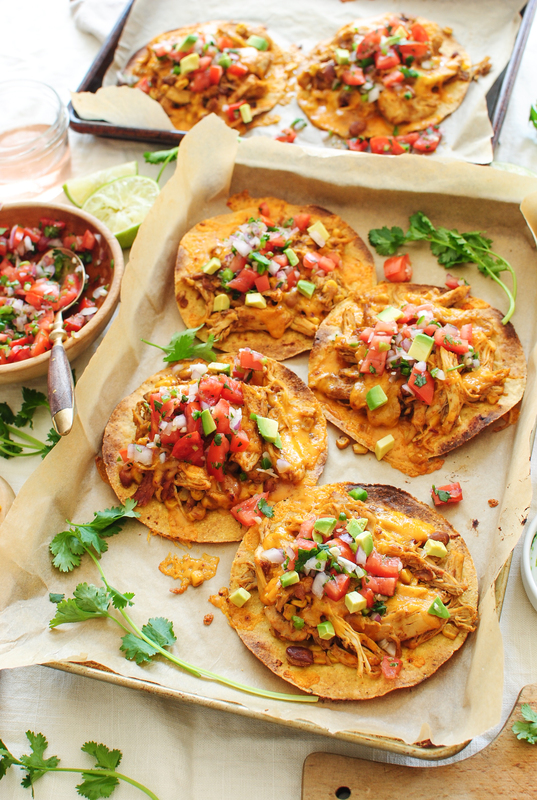 Slow cooker chicken and pinto bean tostadas with fresh pico on top! Ugh. And the cheese? Chipotle cheddar. 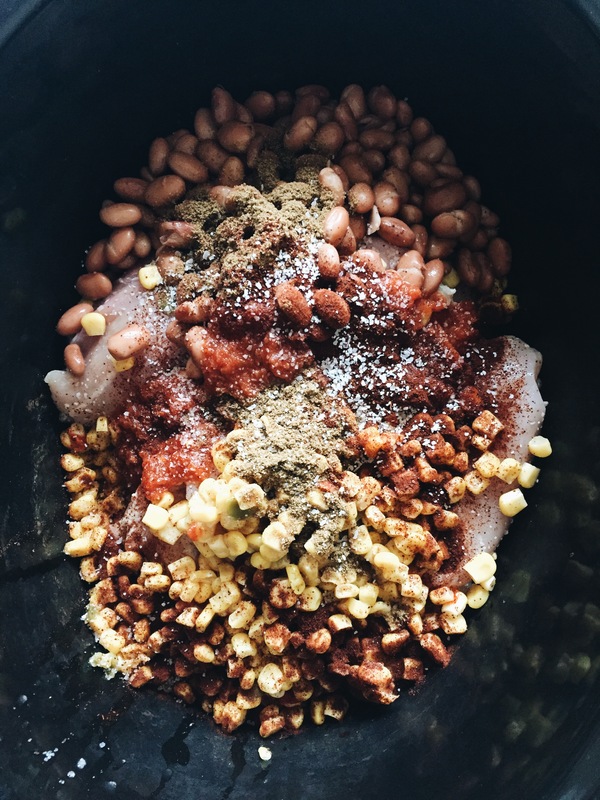 This is one of those you-know-everything-will-work-out-in-life meals, because a) it’s a bunch of chicken and beans and corn and spices and salsa in a slow cooker for 500 days. OR shoot – just make it after work while you’re sippin’ a glass of sauv. It’s yo’ thang. Do whatcha wanna do. Oh, your food doesn’t send you inspirational heart messages while you cook? Oh. This post is short. Mostly because I woke up sick in the middle of the night. Worst sore throat, insano runny nose, and a brain fog that quite resembles the Headless Horseman. It’s a lovely look for me. Or for a few minutes. You may now begin this ^^^. n a slow cooker, combine the chicken, beans, corn, salsa, and spices (including the pinch of salt). Gently toss and cook on low for 6 hours, or high for 4 - whatever works for your schedule. Once it’s cooked, shred the chicken with two forks and give it one more light stir. 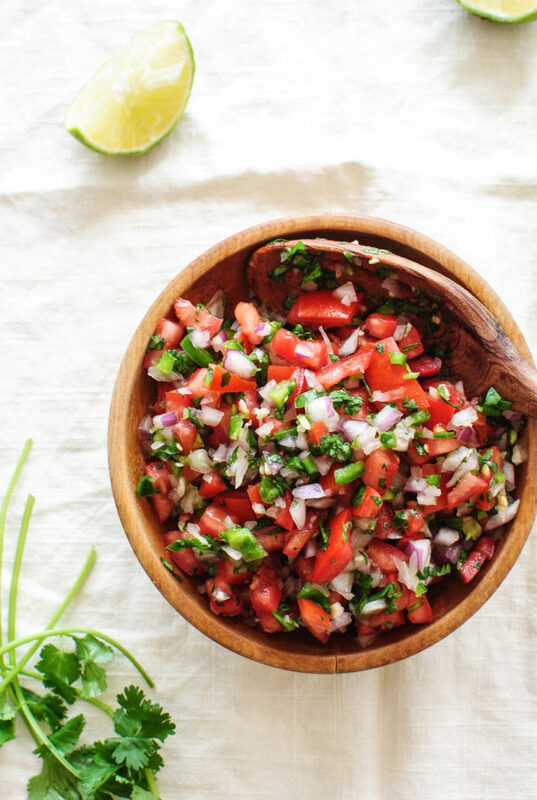 In a small bowl, combine the chopped tomato, onion, jalapeño, garlic, cilantro, lime juice and a pinch of salt. Toss to combine. You can make this ahead of time and store it in the fridge as long as you fancy. Preheat the oven to broil. 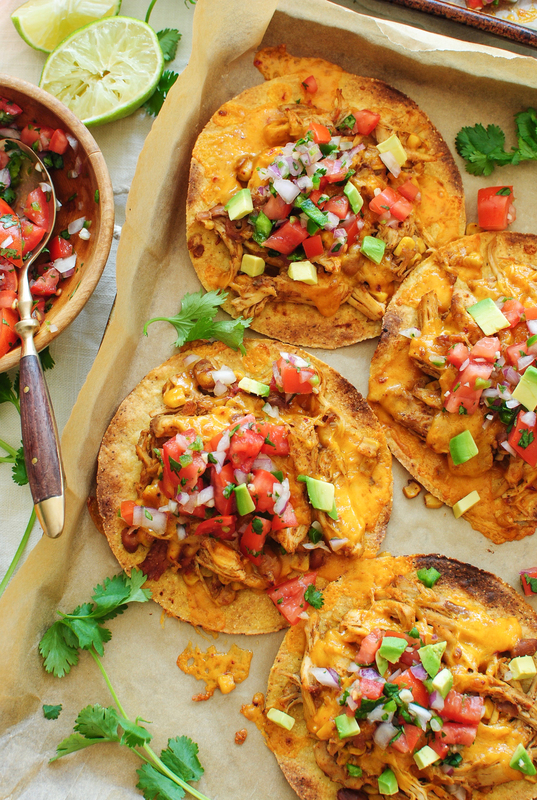 Using tongs, place a mound of chicken on each tostada shell. Evenly sprinkle the cheese over each mound of chicken. Slide the tostadas into the oven and broil until the cheese is melted and started to brown and bubble, like two minutes. If that! Serves about 8! Maybe 9.
feel better!!! :( ^^ that looks DE-lightful. Yummmmmm!!! These look amazeballs, but alas, not many of the ingredients are available here. I'll just weep softly, while stroking my phone screen. I also have to wait to watch This Is Us until Wednesday (#veryunusualkoreaninternetproblems), but I cannot wait. I was starved without it last week! Imma sob my face off again, right? Gah! Totally making these! I ate tostadas everyday last week in San Diego and am completely hooked now! Thanks for the killer recipe ... wonder if they would be great with Rose? I have try to use the slow cooker recipe. It's pretty good for me . But some guys don't have slow cooker. So before your cook. you should be pick up a slow cooker. These are dreamy and so darn easy. 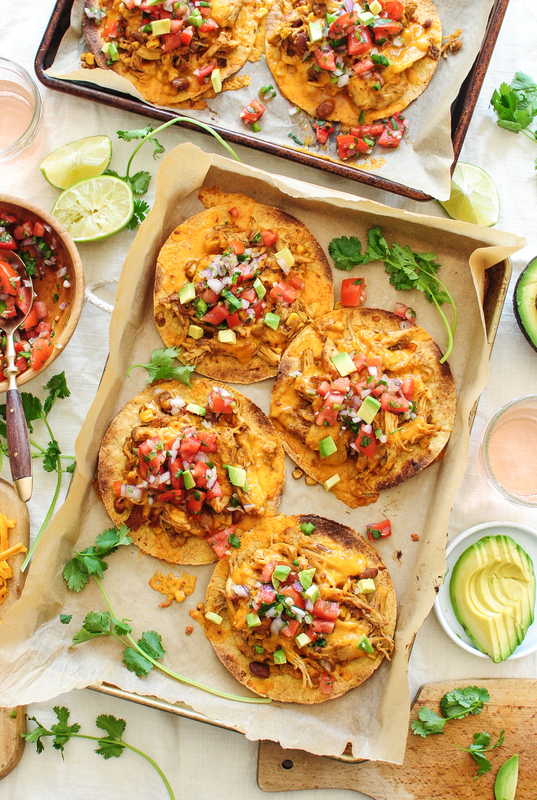 A high protein meal that feels healthy and light and so very satisfying! I amp up the seasonings just a tad. Delicious! Thank you!